Pop-In NordstromVan K Beauty Haul! 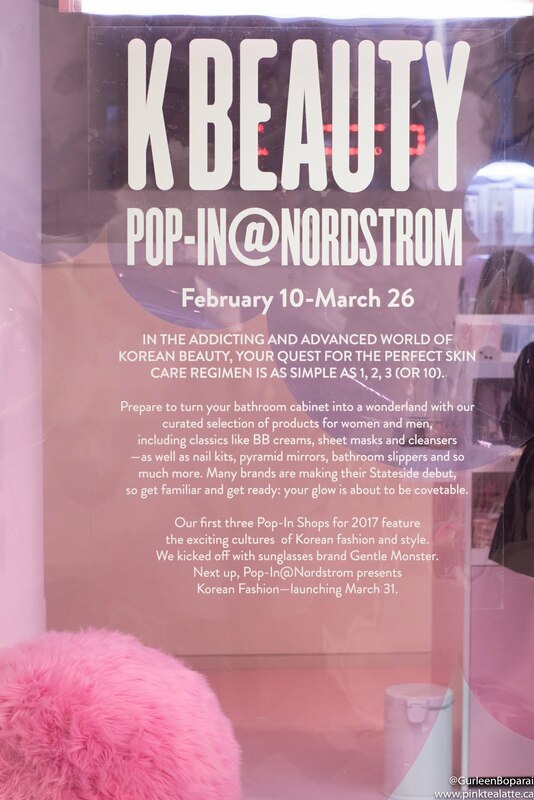 Nordstrom Vancouver has some of the coolest Pop-In shops, so when I heard that the next Pop-In was going to be K Beauty, I made a point to drop by on opening day. I headed over before work on Friday February 17th and allowed myself to splurge on anything and everything I wanted! I generally am very strict with myself when it comes to shopping, so this was a special and rare treat where I allowed myself to buy everything that ended up in my shopping basket. I am really glad that I went on opening day as shoppers were going crazy over the products! Probably half the customers in the little Pop-in space were Nordstrom employees because there is not a lot of back stock of the products. The sales associates were advising shoppers to get the items they wanted because they suspect many of the items will sell out very fast. I walked away with a bag of 10 products for $200 which is a steal! Considering that a lot of these products are not even available in Canada, I would say the products are very reasonably priced. Plus they give you a super cute clear pouch to store all your new products in! As I have not had a chance to really try out the products yet, I will do a review on them in a few weeks, so do keep an eye out for that. I do however suggest grabbing the items you like soon as I am certain they will sell out fast! I have heard so many great things about these three step pore strips and how they work wonders in cleaning your nose pores, so I purchased to packs! 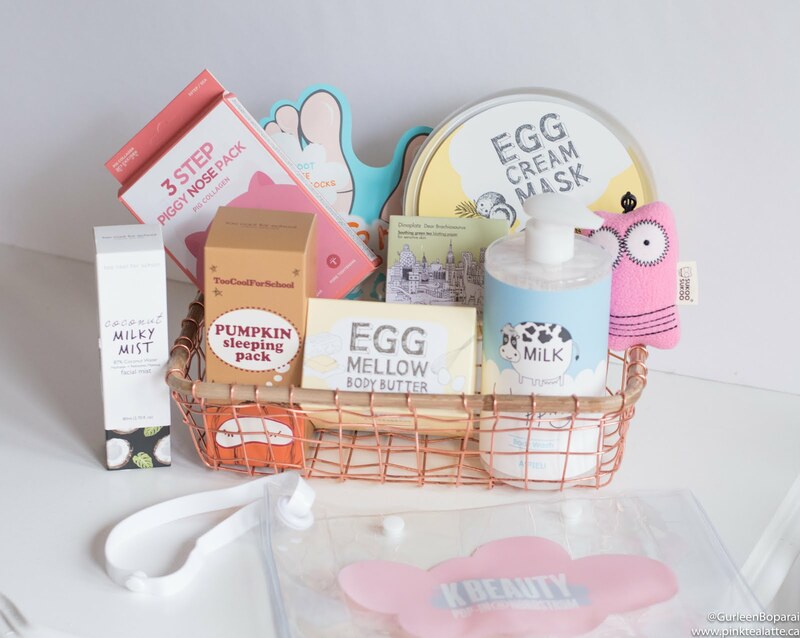 It does sound a little gross that the pore strips are made with pig collagen, but if you are unfamiliar with Korean Beauty products, they use ingredients that we usually not see in North American products. I love face masks; however, I have yet to try an overnight facial mask, so I decided it now was a good time to pick one up. The pumpkin sleeping mask is super cute and thankfully it does not have a strong pumpkin scent. Otherwise, I probably would not be able to sleep with it on because I am very sensitive to smells. I was not planning on getting a facial mist because I have never ever understood the need for one, but the sales associates completely convinced me that I needed it. It also smells really nice haha so who knows, maybe once the weather warms up, I will really appreciate this coconut milky mist to cool me down! My Favourite Pop-In at NordstromVan! I have heard a lot of positive things about the Egg line by Too Cool for School so I could not resist picking up a few of the items. I have never really been a huge sheet mask lover, but girls were snapping up these particular masks, so I said why not. I grabbed the 5-pack and am crossing my fingers for great results. The Egg Mellow Body Butter smelled so amazing and I am a sucker for body butters and lotions, so in it went into my shopping basket. The moment I got home, I moisturised my legs with it. The body butter soaks in to your skin and almost reminds me of Khiel's Whipped Milk & Honey Body Butter, but a little more dense. So I did not necessarily need the Sukoo Sukoo Bag charm, but YOLO! It was so cute, so there was no way that I was going to walk away without one. My shopping spree would have been incomplete without it! You can pick out your own Sukoo Sukoo from an array of colours. The big pink Sukoo Sukoo is the bath scrubber accompanied by a mini Sukoo Sukoo Bag Charm. I wanted this package, but I could not justify spending $45 on a pretty loofah! I have a greasy T-Zone, so me and blotting papers are best of friends! Aside from the adorable design featuring dinosaurs and a city skyline, these blotting papers are infused with green tea. This was an intriguingly packaged item and I actually did not even know what exactly it was until after I purchased it. So they are these "socks" that you wear on your feet for 30 minutes and then over the next few days, all the dry dead skin on your feet fall off. Sort of gross, but super cool at the same time. Clearly I was not the only one who was curious about the Soft Foot 30 Minute Peeling Socks because they were sold out when I went back the day after. This purchase was purely based on the packaging being too cute to pass up. This body wash has an adorable cow called MILK on it! I do not think this body wash is anything special, but sometimes you just need cutely packaged shower products. A lot of these items are already on back order online, so if there is something you really like and want, I highly recommend ordering it soon! I will post my thoughts on the products in a few weeks as I want a chance to really try them out before giving you all my opinion. Let me know in the comments below what you think of my crazy K Beauty splurge? Think I snagged some good items? Also, please let me know if you think there is something I really should try. Sometimes technology just does not like me very much because this entire blogpost disappeared on me as I was doing my final grammar edits. So this is me starting from scratch at 10PM at night, but I am going to get it done and published before I head to bed....I did not manage to finish last night, so the post is a day late :( I am sorry! Valentine's Day for me is about sharing how much you love and care for the people in your life. It does not necessarily need to be your significant other because I personally deeply care and love my besties and they too deserve to feel special on February 14th! Therefore, Valentine's Day for me is like Friend Appreciation Day too or popularly termed - GALENTINE'S Day! Hehe also, no one is going to turn down sweets and beautiful flowers, am I right? Lastly, I really do not feel it is necessary to splurge on lavish gifts because it is about making the other person feel special, not about spoiling them with materialistic items. I love fresh cut flowers; therefore, it is no surprise that flowers are on the top of my Valentine's Day gift guide! For me, flowers are always associated with a special occasion and generally makes the receiver feel very special. Vancouver has some very amazing florists, but I tend to always return to Garden Party Flowers. Ask for a floral arrangement instead of a bouquet so it is ready to displayed in your home. How cute is this copper toned lock and key from Urban Outfitters?! The lovers lock has an engraved heart in which you write your initials before hanging it at a popular lover's lock spot.I know there is a bridge in New Westminster and cannot wait to put my lock on it. I spotted this book in Urban Outfitters' Valentine's Day display and decided to take a quick flip through it. The book is so adorable and sort of just sums up truly the difference between like and love. Just a fun gift to give that will also bring a smile to both your faces. Last spring, Vancouver finally received its first Laduree boutique! I know it is a bit of a splurge and I hate to admit to be the one to admit that the overly hyped Laduree macarons truly deserve the praise. I have had macarons from various patisseries, but none have come near to achieving the depth of flavour Laduree's macarons. Most importantly for me, unlike the other macarons I have tasted, only Laduree macarons are NOT overtly sweet! 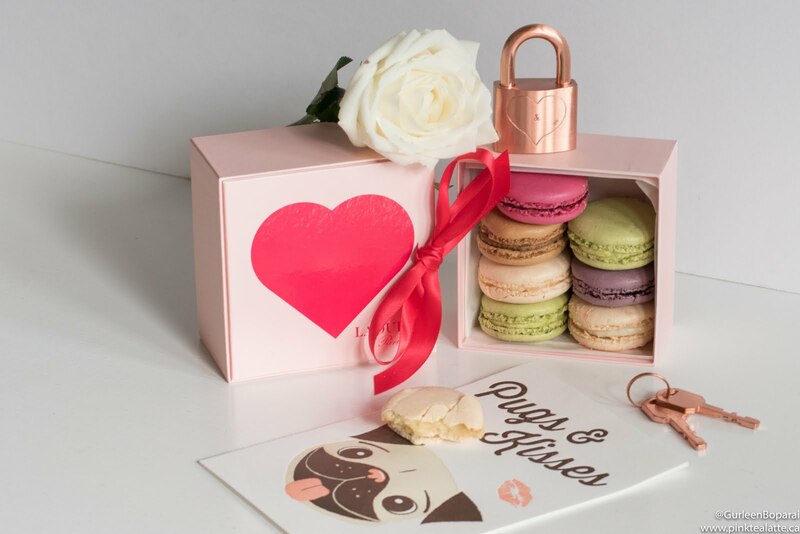 Lastly, I am a sucker for cute packaging and limited edition Valentines macaron boxes are ridiculously cute. Did I mention you can record a cute 15 second message that will play when the box is opened. Write them an adorable Galentine's day card. Just make sure the card is quirky and cute because picking the perfect card is what will make this gift AWESOME. I am into the silly pun cards, but I am also a sucker for cute graphics. I picked up the Pugs & Kisses card from the stationary shop in Oakridge named Papyrus. Sometimes the best gifts are not objects, but the memories you make doing something you both love. There are some really fun activities you can do in the Lower Mainland like attending a 4Cats craft class together or if you both enjoy cooking, then reserve a spot in one of The Dirty Apron's cooking classes. Be sure to take lots of pictures so you can look back on the fun times you had together! I hope this list gives you some fun ideas to show your lover or your bestie how much you love them! Spread the love dolls! Torafuku is a contemporary Pan Asian restaurant that is just on the cusp of Chinatown. Many of us pass by it without even a second glance, but this hole in the wall is far larger and bursting with amazing energy. I was appalled by how full this restaurant was and it is only a testament of their delicious menu items. Their menu is set up slightly different from other Dineout Restaurant participants. The Torafuku menu is set up to be shared family style; however, it also means you can only choose one dish from each category. For those of you who know me, I am not a big seafood eater, but my friend really wanted to try Torafuku and since I always end up choosing the places we dine at, it only seemed fair to let her have one pick. We went with the Dy-No-Mite roll as our first appetizer. 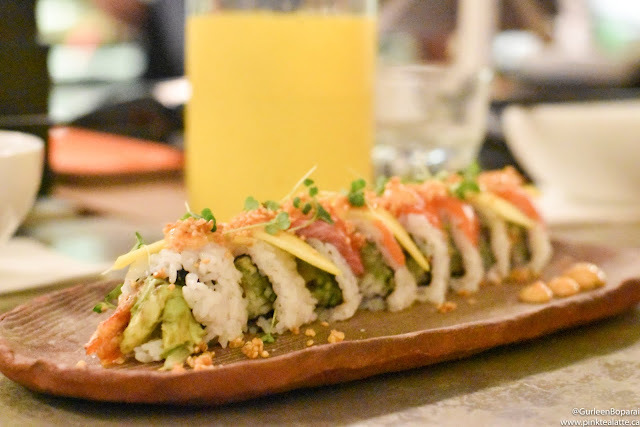 The roll contained prawn tempura, avocado, cucumber, steelhead, fresh mango and togo aioli. I picked out the prawn tempura and steelhead and gave it to my friend, but the remaining parts of the roll were delicious! Also, when it comes to me, you can never go wrong with fresh mango. 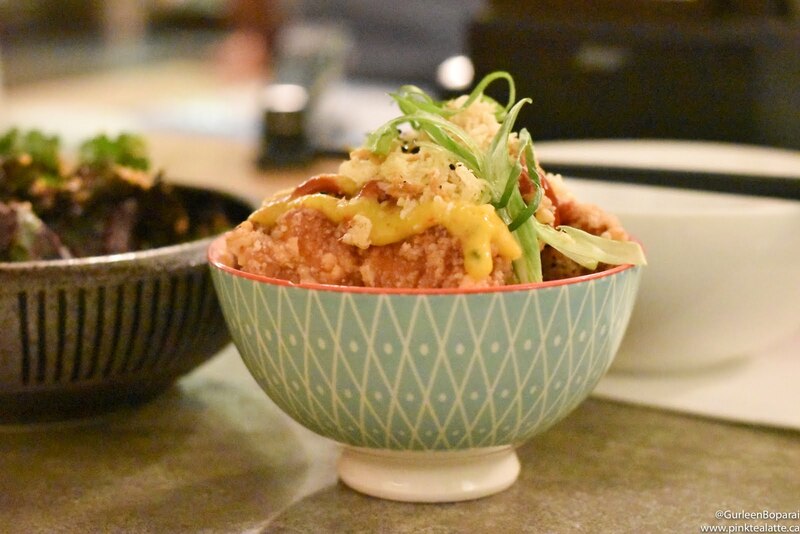 For the second appetizer, we ordered the Rye So Messy Chicken Wings - literally finger licking delicious ramen crumble coated, Rye and Korean chilli marinade finished with mango glaze (yes mango) and kfc sauce. The chicken wings were crispy and full of flavour, with a bit of sweetness from the mango glaze to balance the spice from the marinade. The meat practically fell off the bone. Probably some of the best chicken wings I have ever had and also the fanciest! Torafuku also earns some bonus points from me as they served some complimentary dishes in addition to the menu items. From what I could observe, all diners also received garlic popcorn and a big bowl of kale salad! I have never had kale salad before, so this was a first for me. I know, I live in Vancouver and I have not had a kale salad?! Just think of spinach, but requiring three times more chewing due to it being far more fibrous. So definitely a bit of a mandible workout. As I mentioned earlier, my friend really wanted to try Torafuku, so I wanted her to choose the menu items and even if it meant choosing something more seafood focused. We had the FOB (Fresh off the Boat) as our entree. 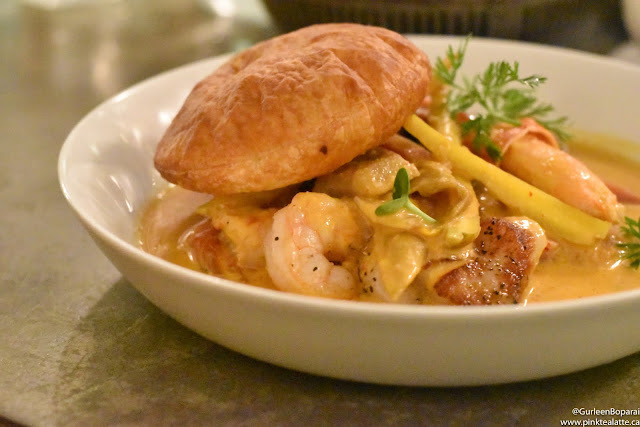 Sitting in a bowl of "fuku" style Laksa was artfully arranged crab, scallops, prawns, clams, salmon, market veggies and a flakey puff pastry. Laksa is a Malaysian Chinese full of flavour soup that I sopped up with the puff pastry. My friend ate all of the seafood and said it was perfectly cooked and bursting of flavour. I am going to take her word for it as we both are huge foodies! Of course, when you are with me, no meal is complete unless it involves dessert!!! Torafuku must have known I was coming because they did not limit us to only one dessert between the two of us. I wish all restaurants could follow in Torafuku's exemplary dessert rule. 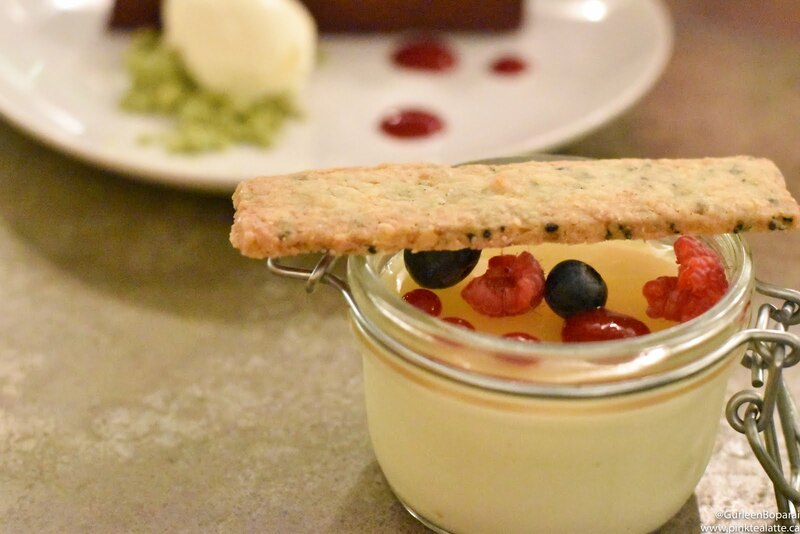 The Milk & Cookie was a refreshing vanilla panna cotta with a layer of yuzu gelee and a garnish of raspberry coulis and an almond black sesame shortbread. Astonishingly I was so full from the meal that I could not finish the panna cotta. 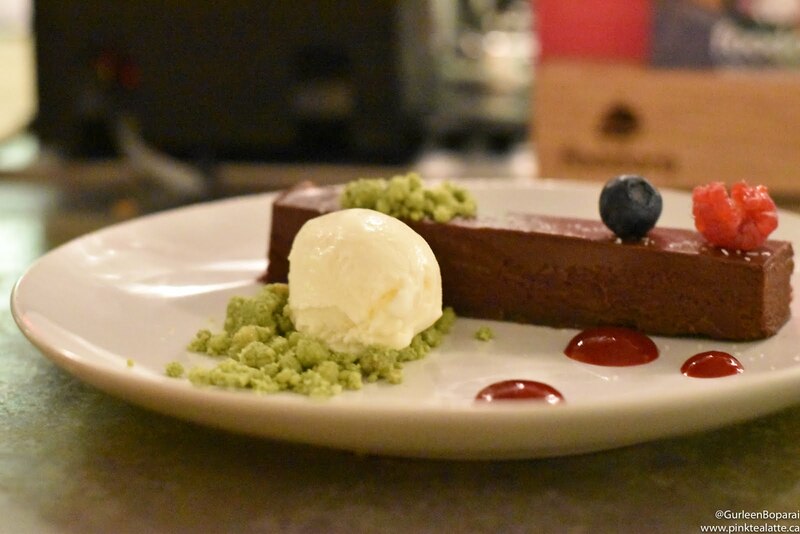 The oddly named "magic stick," was a creamy chocolate ganache sitting atop of a hazelnut feuilletine and matcha crumble and a scoop of condensed milk ice cream. I tend to not like ganache heavy torte like chocolate desserts as they tend to be just a big piece of dense chocolate. However, the condemned milk ice cream was divine and the matcha crumble was a great textural addition to this dessert. Between the two desserts, I would probably go with he panna cotta unless you really like chocolate tortes, then choose the magic stick. This was a great dine out experience and I highly recommend Torafuku if you are still planning on doing a dine out. You could taste the freshness of the ingredients they used and the staff was alert and attentive regardless of how insanely packed the restaurant was. I even fell a little ill during the dinner, I vomited the first course, but the staff were so sweet and checked on me throughout the night. Let me know in the comments below what Dine Out 2017 restaurants you have visited.